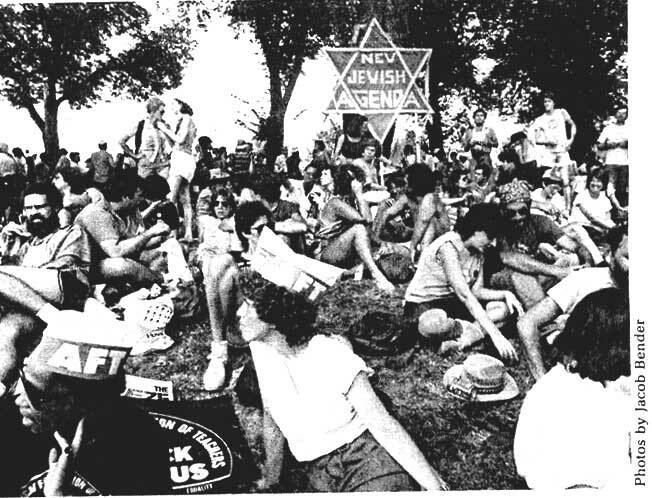 Agenda organized the Jewish contingent for the 1983 20th Anniversary March on Washington for Jobs, Peace, and Freedom and a Friday night event (Shabbat service and celebration), which brought together over 500 people. Jewish involvement in the march had become controversial, especially around tensions between Blacks and Jews. Agenda ended up being the only national Jewish organization that joined the march but the images of hundreds of Jews marching with a 24-foot banner that read “Justice, Justice Thou Shall Pursue” created an opportunity to build bridges and demonstrate commitment to the weekend’s themes. Blended religious and secular observance, the Friday night gathering included speeches by Martin Luther King III and Susannah Heschel (whose father, Rabbi Abraham Joshua Heschel had been a close comrade of Dr. King)1. Agenda chapters around the country were active in coalitions to combat racism, anti-Semitism and apartheid. 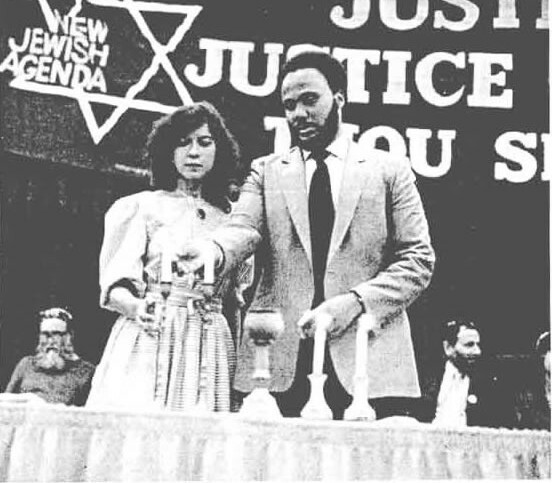 Agenda sponsored Hanukah, 1984 vigils outside South African consulates in five U.S. cities which “received press from Seattle to Wash, DC and from Paris to Capetown,” according to a 1986 report-back. Agenda also organized a six-week tour featuring one of South Africa‘s most prominent rabbis active in the anti-apartheid movement, Ben Isaacson, and a leading Black South African minister, Rev. Zachariah Mokgebo. The conference received significant criticism, especially for a lack of representation of Jews of Color, reinforcing a false dichotomy between white Jews and African, Latin@, or Arab peoples. Also, conference sessions addressing Class were well attended, and attention was paid to creating a financially accessible conference, but participants identified a need for more focus on how Class intersects with Racism and anti-Semitism. Despite criticisms, conference participants reported leaving the conference feeling inspired, motivated, and re-committed to local organizing around resisting and undoing Racism and anti-Semitism. This was the last official NJA conference. Susannah Heschel and MLK III Rally. Shabbat Service during March weekend. Photo by Paul Sarokin. March for Jobs, Peace, and Freedom. NJA Newsletter # 13, Fall 1983.